Have been using TFF a few years now with no issues. Installed FPR1 upon release....no issues until today, but have now had system crash 'Firefox Panic' twice now in last three hours. Other than the unfortunate crashes, everything in FPR1 seems just fine. Any insight on sudden bout of system crashes calling 'Firefox Panic' greatly appreciated! I don't know what a "Firefox Panic" is. 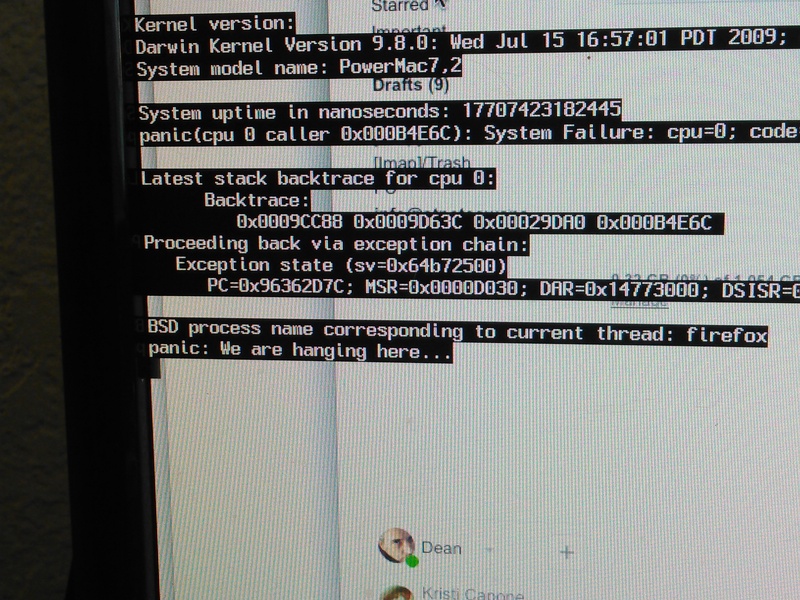 Is this a kernel panic or something else? panic", which I've certainly never seen. 45.9.0 for time being, and that's running just fine, same as always. If you can take a picture of the screen with a cell phone or something, I'd like to see it. For the record, this is being typed on FPR1 with a PowerMac 11,2 (Quad G5). I have 16GB of RAM, but MenuMeters shows barely 1200MB in use, so I don't think memory pressure is the problem. If you create a clean new user account and run TenFourFox in that, do you see a similar problem? It's possible TenFourFox is conflicting with a kernel extension or haxie. believe you're right there's a conflict somewhere. 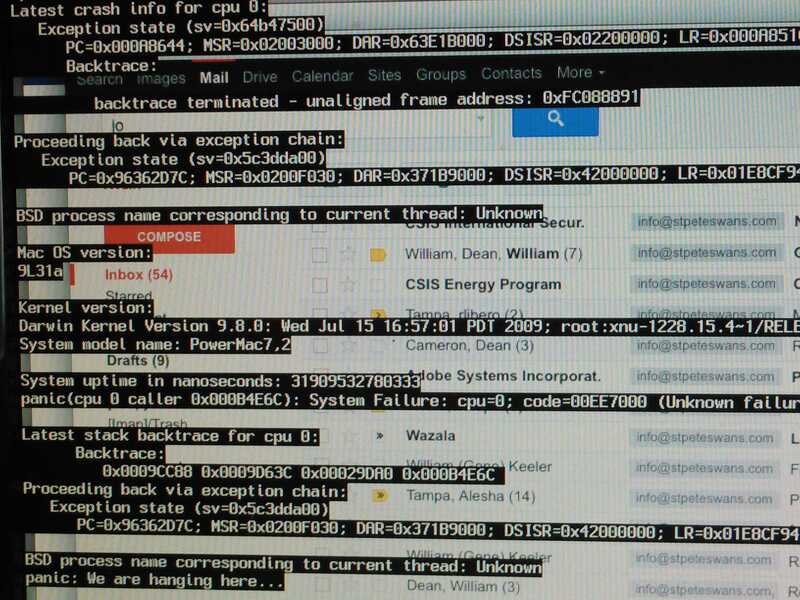 This is the ugly type of a regular kernel panic. "firefox" and "panic" are two different lines. One could read it as "firefox panic", though :-) But it isn't, it's the system that crashed, not Firefox/TenFourFox. First please perform the Apple Hardware Test that came on the original install DVD/CD for this Mac. Make sure the HD test and the extended RAM test pass. (Kernel panics are usually due to a failing HD or defective RAM). If everything is o.k., open Disk Utility and check the SMART status of the startup disk. The click "Verify Disk" and let it repair any errors. The third common reason for panics are third-party Kernel Extensions, did you install anything recently? it that way. Thanks again!